WESLEY CHAPEL, Fla. — Three Marines pushed each other as they recovered and adjusted to a life as double amputees. While rehabilitating at Walter Reed National Military Medical Center, John Curtin, Ben Maenza and Joey Woodke discovered they had similar interests, interests that ultimately led to them becoming teammates on the ice. Indeed, sled hockey has proved to be the ultimate bond for these men, injured within a roughly six-month period of each other bridging 2010 and 2011. They were in different combat units and did not know each other until meeting at Walter Reed. Today, they are inseparable and found themselves in Wesley Chapel, Florida, last weekend for the 2019 Toyota-USA Hockey Disabled Hockey Festival. “Hockey really gave us something that we were missing,” said the 30-year-old Maenza. The three play for the Nashville Sled Preds. Maenze is a Nashville native. Curtin hails from Poughkeepsie, in New York’s Hudson Valley, and Woodke is from Michigan. Growing up in Tennessee, Maenza did not know much of anything about hockey. Curtin played pond hockey when he was younger, but little more than that. Woodke is from Michigan, but hockey? 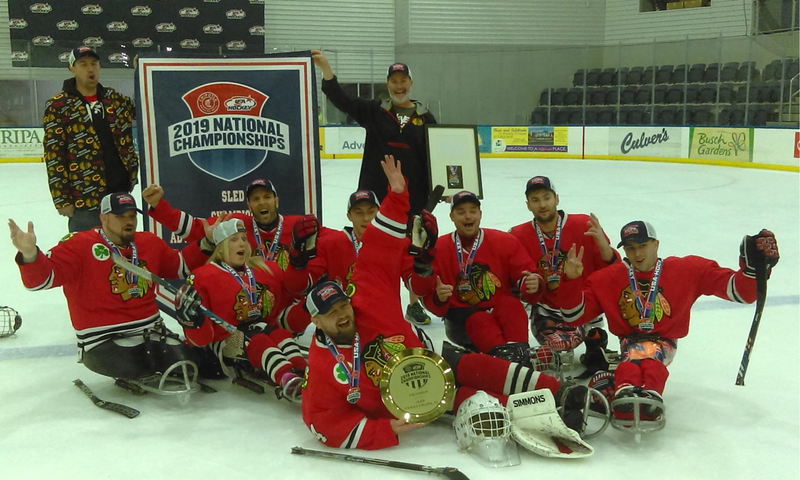 The Sled National Championship tournament is part of the 2019 Toyota-USA Hockey Disabled Hockey Festival, which spans two weekends and includes all six disabled hockey disciplines represented with USA Hockey. In 2015 the Sled Preds played in its first Festival. To be together at this annual event is a special feeling as it evokes memories of the first one together. It also showed the three of them that while they needed some work, hockey was going to be their sport. The journey has taken the three of them and their teammates from the Tier V Division that first year in Buffalo to the National Division, which they are a part of for the first time this year. For those unfamiliar, the higher the division, the stronger the competition. When it comes to the National Division, that competition includes players within USA Hockey’s national team pool that is spread across the three teams: the U.S. National Sled Hockey Team, the U.S. Women’s Development Sled Hockey Team and the U.S. Men’s Development Sled Hockey Team. In other words, Curtin, Maenza and Woodke have helped their Nashville Sled Preds go from fresh-faced rookies to playing some of the nation’s best sled hockey players in a four-year span. But before they helped their team climb the ladder, even before they ventured onto the ice, Curtin, Maenza and Woodke were engaged in various athletic competitions. The trio competed in numerous marathons such as hand-biking with the Achilles Freedom Team, a program that brings wounded veterans together and works closely with therapists at Walter Reed. After leaving Walter Reed, the three went their separate ways, but met at the marathons and otherwise stayed in touch. With a strong bond between them, Woodke and Curtin ultimately moved to Nashville so the three could be close together. That set the stage for their involvement with the Sled Preds. It was Maenza, the Nashville native, who got his buddies on the ice. “We’re all living in Nashville and sitting around one day and Ben was like, ‘I tried sled hockey and you guys should come play,’” recalled Woodke. So they did. They joined the Sled Preds and had only a couple of practices before heading to the 2015 Festival in Buffalo. The Nashville Sled Preds is a team that also features Michael Paul, a U.S. Army veteran injured in a non-combat accident, and Heath Calhoun, a U.S. Army veteran and double amputee who served in Iraq. Calhoun took up skiing before hockey and won silver in super combined at the 2014 Paralympic Winter Games in Sochi, Russia. It was also at those 2014 Paralympic Winter Games that U.S. forward Travis Dodson (Deming, N.M.) first learned of sled hockey. Four years later, Dodson was a member of Team USA’s gold medal-winning team at the 2018 Paralympic Winter Games. It has indeed been awesome for Curtin, Maenza and Woodke to continue to thrive at a sport they have only been playing a few years.